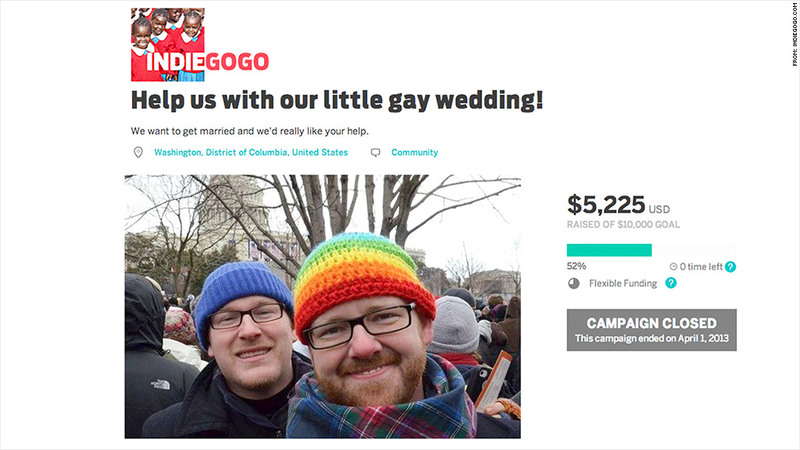 Jamie McGonnigal and his husband Sean Carlson paid for almost a third of their wedding expenses with money they raised in a crowdfunding campaign. As weddings get more and more expensive, some couples are turning to friends, relatives and even strangers to help pay for their big day. "We're trying to save as much as possible," said Rodriguez, who said they cut their guest list from 200 to 135 in order to trim costs. "The rest is pretty much depending on our family and friends." GoFundMe would not provide fundraising totals, but said more than 16,000 donors have contributed to these wedding and honeymoon fundraising campaigns. But while some campaigns attract thousands of dollars, many receive only a few hundred, if any money at all. Walker and her fiancé, John Schneider, have received $500 from half a dozen people since starting their fundraising page in early May. With their parents unable to contribute much, the couple is hoping to stick to a $3,000 budget. "I'm not yet convinced that the general population is ready to receive a link about crowdfunding a wedding they are invited to," said Post, the great-great-granddaughter of now-deceased etiquette expert Emily Post and a spokesperson for The Emily Post Institute. The funds they received covered around a third of the $15,000 in expenses they had for their Provincetown, Mass., wedding last May. 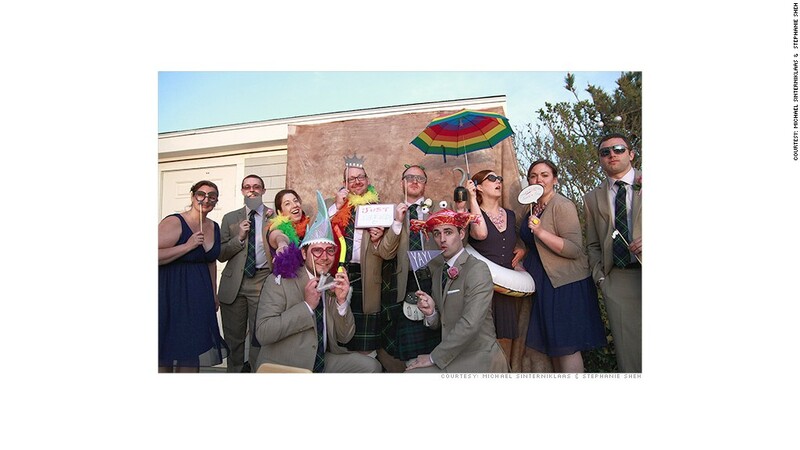 McGonnigal and Carlson (pictured in the center) at their wedding last year. Still, McGonnigal said some people weren't as supportive. "I definitely got a lot of push back from a few people," he said. McGonnigal even found an online message board attacking the campaign. But there are some cases where people are willing to chip in -- especially when a couple is down on their luck. Take, for example Brandi Ryans and R.J. Foster, who saw their wedding plans crumble in May when the owner of a popular Brooklyn, N.Y., restaurant called reBar unexpectedly shut the place down after having taken more than $1 million in wedding deposits. The New York Attorney General's Office estimates Stevens owes $1.8 million to around 150 couples. While Stevens has agreed to pay restitution to these couples, it's unclear if or when he will have the money to pay them back. "It has been a roller coaster, but it's hard to still be angry when this many people are doing such amazing things for you," Ryans said. "It's making this wedding that much more special knowing it was put together with so much love."